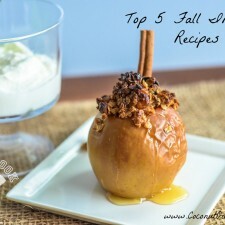 Baked Stuffed Apples - Yum! Today is the official start of the Autumn equinox, where there is exactly 12 hours of daylight and 12 hours of darkness at the equator. This also symbolizes the first day of Fall, which means lots of Fall and Harvest Festivals are upon us, as well as Fall inspired recipes! Since the last few months of the year are my favorite, I wanted to gather a few recipes that I LOVE to make during the cooler months. All of the recipes below are made with coconut oil, as a replacement for butter or other oils. Coconut oil is a healthy fat that is used as an energy source when consumed and not to mention, has an amazing flavor profile. When using coconut oil in any recipe, simply replace it in a 1:1 ratio for butter or oil. 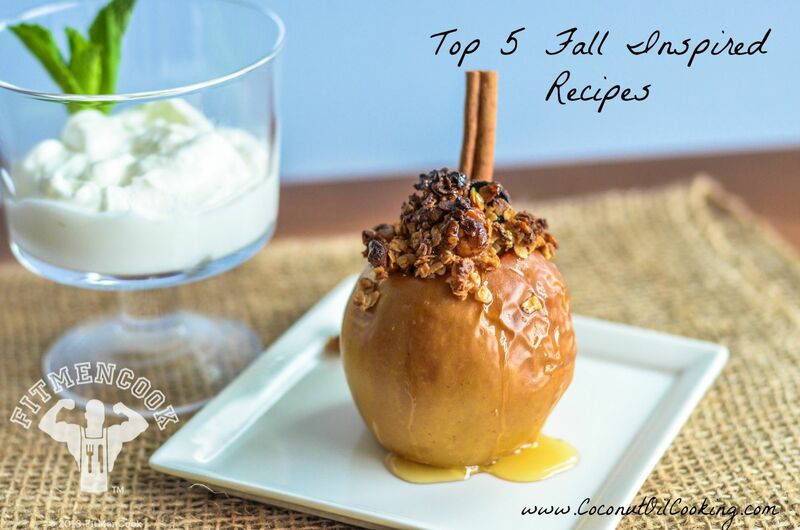 Here’s a list of my top 5 favorite fall inspired recipes, which are great for weekend fun, Thanksgiving, or any other entertaining event. Healthy Sweet Potato Muffins – The taste of sweet potatoes always brings me back to the days of Fall. This recipe is packed with vitamin A, C, plus all of the protein and calcium you get from the Greek yogurt. You can make these the night before and enjoy in the morning either room temperature or warmed up with a little coconut oil. What better way to start breakfast of have a snack that is soft and sweet, without the guilt. Creamy Vegan Pumpkin Soup – Fall screams pumpkin everything and this Vegan pumpkin soup is a wonderful dish for entertaining. The coconut adds so much depth to the soup and under tones of a tropical vacation. Try this soup warmed up the day after I make it because the flavors have more time to develop. Healthy Turkey Chili – Chili is a great meal for warm and cozy nights by the fire! I love this recipe because it contains lean protein, vegetables, and healthy fats – all in one. Try topping this dish off with sour cream, cheese, and scallions for a finishing touch and added flavor. As a tip, you can always stick to fat-free or reduced calorie sour cream and cheeses to keep your bowl at that healthy level. Stuffed Baked Apples with Vanilla Greek Yogurt – I’m a huge fan of this dessert for entertaining. The presentation is absolutely beautiful and you really can’t beat the taste. This recipe calls for a vanilla Greek yogurt as a side, but feel free to dress this up with a scoop of vanilla bean ice cream. Hopefully you got some ideas for Fall inspired recipes that can be put to use in the upcoming month. What’s your favorite recipe for Fall?